Thinking about nominating someone for the ACS Publications 2017 Fall Lectureship Series? You should be. These awards are not just tremendous professional honors. They also come with substantial honoraria and travel grants to enable winners to attend important conferences, such as the 2017 ACS Fall National Meeting. With so many ACS Publications journals offering lectureships, there’s something for everyone. Deadlines vary between lectureships, however, so look over the list today and get started with the nomination process. 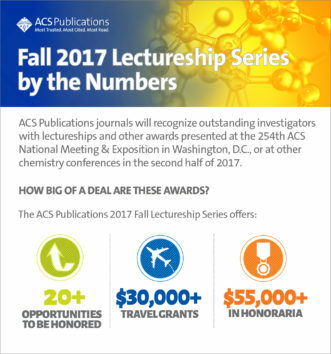 Learn more about the ACS Publications 2017 Fall Lectureship Series.